If you're linking up with us today - be sure to grab our graphic, link back to one (or all!) 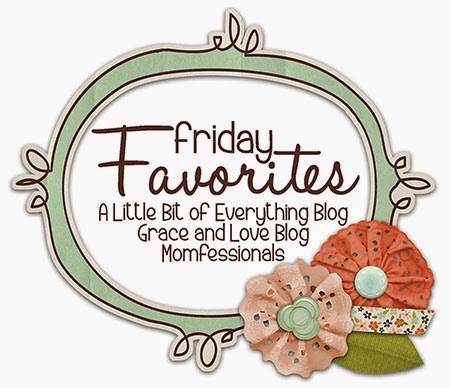 of us and then share your Friday Favorites! First up on my list is Elf on the Shelf! I will admit - it's one more thing on our plates - which are PACKED this time of year - but seeing the MAGIC on a daily basis through my kids eyes is totally worth it. I read this on a blog this week and it pretty much sums up my thoughts on it... "Is Elf on the Shelf a cheesy popular holiday trend that's possibly shallow and sometimes annoying? Sure. But it's also just a toy elf with a made-up story that inspires the imaginations of my kids... and I'd never want my grownup cynicism to harm my kids' spirits. 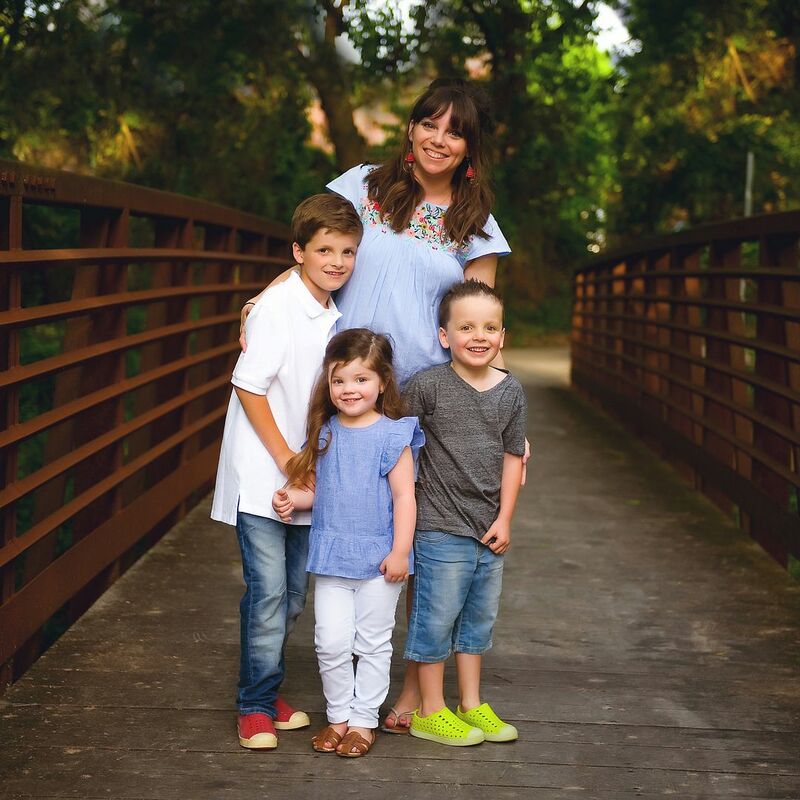 As their daddy, I want to be a champion of their imaginations, an inspirer of their creativity, and a proponent of their childlike joy-filled delight." 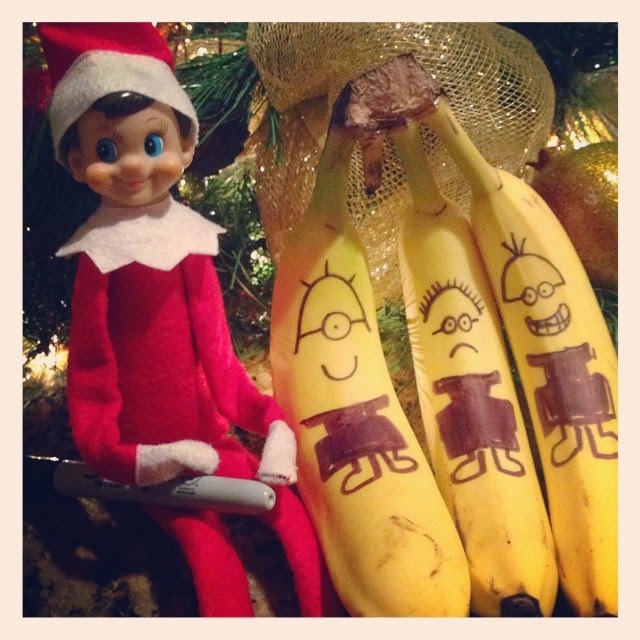 So on that note - here are a few of our FAVORITE elf antics from the last week or so. He wrapped the boys bedroom door like a present.... and made a little bow tie to match! This one was awesome!!! Sunday night we colored the kids noses with a red crayola marker. Believe it or not they didn't even budge!!! Then Dave and I colored our own noses and went to bed. When Luke came in our room in the morning he goes, "What's on your noses?!?!?!" and we go, "What??? What's on YOUR nose?!?!?!" 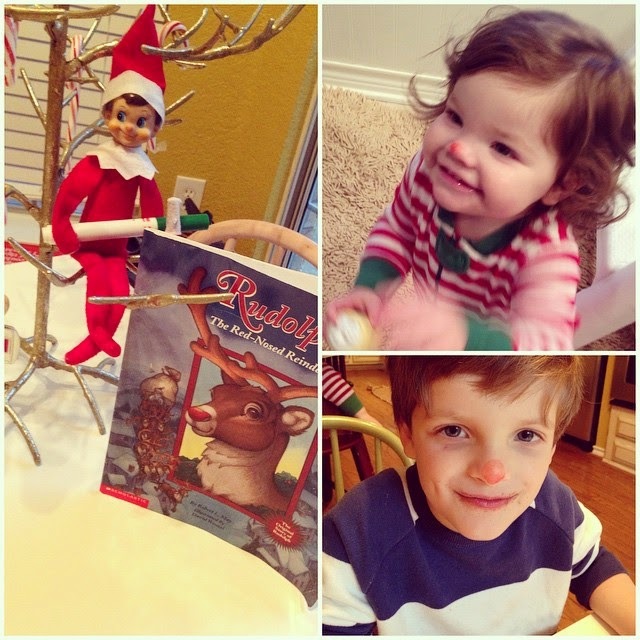 and then ensued a lot of giggling in the mirror :) We found Buddy sitting with a marker and the Rudolph the RED NOSED reindeer book. They're STILL talking about this! WARNING! We still had slightly red noses when we went to church.... despite some scrubbing. And camping by the kitchen tree. Yes.... that's ketchup. You do what you gotta do. Next up is my new favorite brand of books - Usborne. A few weeks ago, Usborne sent my kids a box full of ADORABLE books. Like, seriously adorable. The boys got a pirate book that has a windup ship that actually goes around the pages. SO CUTE!!! And she pulls out the touchy-feely animals book on the daily. They also sent the Big Book of Dinosaurs - which has been Luke's "you can read for 20 minutes before lights out book" for the last several weeks. Every book is super fun, great quality and you can search by age and/or topic. Books will ship out immediately in plenty of time for Christmas! Click HERE to shop!!! And how awesome is this.... Usborne is giving one of you a $50 shopping spree!!! Last up, this video is my absolute new FAVORITE thing ever. As I wrap up my Christmas Card season I can relate more than I'd like to.... I watched it at least 6 times and laughed super hard each time. Trust me - you want to watch it. Love your elf ideas, we didn't do the elf this year because we have an 11 year old (who is 'too old' for it) and an 18 month old who wouldn't 'get it'. I love the ideas for next year though. Also I would love to win the books! My little would love them! My two year old would love that mini machines box set!! I would love to win some books for my kiddos! That video--I saw it yesterday, and it is hysterical!! Also, those books look amazing! So fun!! That video parody is hilarious! It's so nice to start the morning with a good giggle! Thanks for sharing! My son loves the "That's not my...." books and I know he would like the search and find ones. I love Usborne books and have been wanting to get more. This would be perfect!! I would pick a dinosaur book and an eye spy book for my boys! I am so so thankful that so many people share their elf ideas, I admit this elf thing can be a little stressful but I absolutely love how "real" Olivia thinks it is....have a great weekend!!! My son loves pirates so I'd get him the wind up pirate book. Ahoy there, matey! I've totally stolen some of your elf ideas! Love them. Our kids also love usborne books and that video is hilarious. We love Usborne books at our house! Those books look great. Would love some for my kids! We have a lot of Us borne books for our schooling- a neat company! Love all your elf antics!! We love usborne books already, but we don't have that's not my princess, so that is one I would get for sure. They are great books! Happy Friday! Great elf ideas!! Those books are awesome! I have a little girl who would also love that's not my princess book! 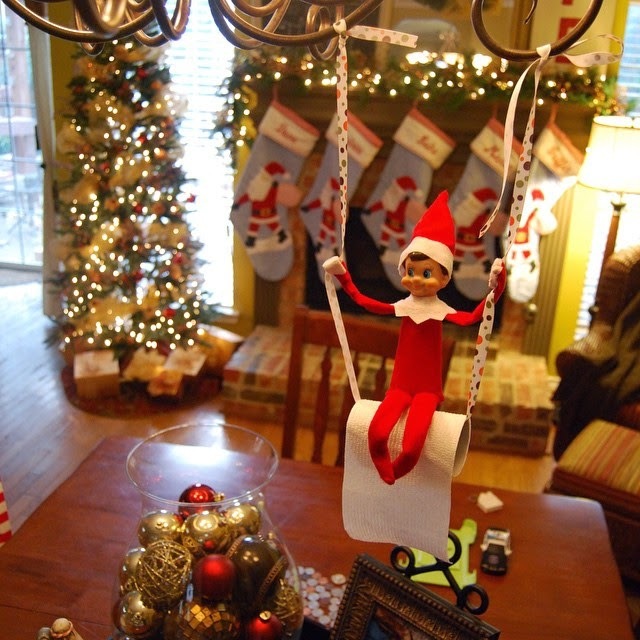 I did the potty elf after seeing yours and my kids got such a kick out of it! You have great ideas. I have 4 kids so I would have a hard time picking which books to get! My 2 year old could use some fresh board books and my 7 year is a HUGE football fan so those football stories look real cute! You are awesome with your elf shenanigans! I LOVE the red nose idea! We don't do elf on the shelf but if we did, I would definitely put that one on the list! My kids would love these books (ages 6, 4, 1). Happy Friday! Definitely "A Football Story" for my little boy:) Thank you! My kids would love the step-by-step drawing book! I've seen that Taylor Swift parody video and thought it was funny and relatable! We have the Usborne wind-up helicopter book that travels through the pages and love it! My five year old son loves hidden pictures and pirates, so Luke's book that you featured would be perfect in our house as well! I've been stealing your ELF ideas, thanks for posting! :) Love Usborne books as well, we need a few more girly books in this house. Anything pirate or princess with two 6 year old boys and a 2 year old girl. But I loooove the box of early reader books. Reading for one of twins has been a challenge and I am always on the hunt for fun easy readers to keep his interest and encourage his growth as a reader! I love reading your blog!! Thanks for the elf on the shelf ideas! This would be awesome! My 8-yr old loves to read!! I think the Dino book would be awesome for my little guy! I love books as a teacher and former reading soecialist! Great giveaway! My 6 year old and 3 year old would LOVE this! Fingers crossed love books!!!! Happy Friday! I haven't gotten into the Elf on the Shelf for my kids, but I love seeing all the cool things other parent's come up with for theirs! I would get the Christmas musical books for my kiddos! Love the "That's not my..." books! Love Usborne books! I have a 14 month old that would love some books for Christmas! We love Usbourn books. My son would love the seek and find pirates! I would love some new books for my niece and nephew! 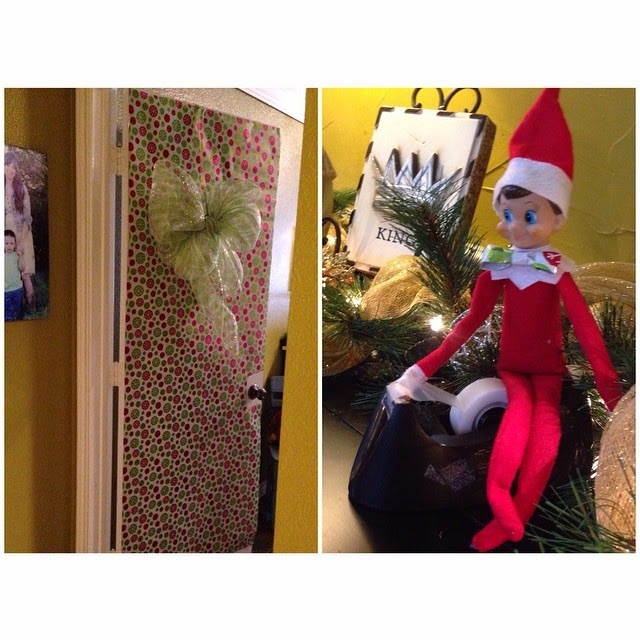 Your Elf is SO creative!! My kids love those books too! I love that pirate book! I would get that one for my son. 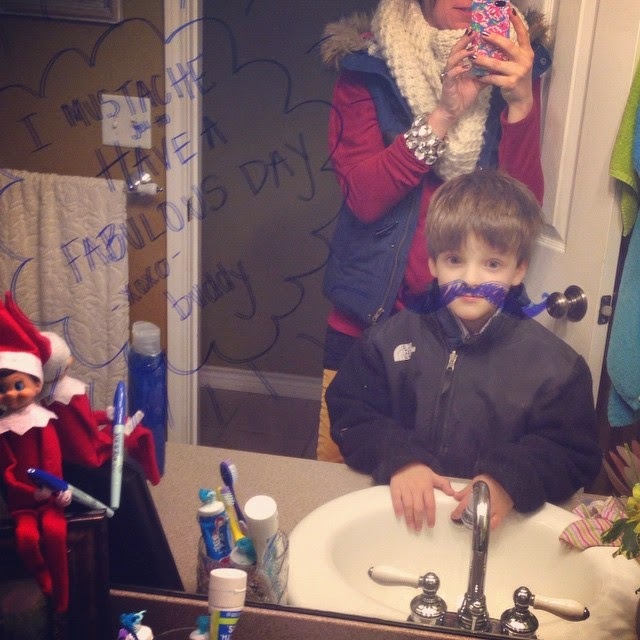 We tried the elf last year with my then 3 yr old and he just wasn't into it at all. If he had been I totally would be doing all the elf antics too. This year I just made a countdown board and he gets to open one small bag each morning and it has a $1 toy or piece of candy each day. He loves doing that! I guess his love language is gifts LOL. I love these books for my grandsons! The Dino book would be a welcome addition! 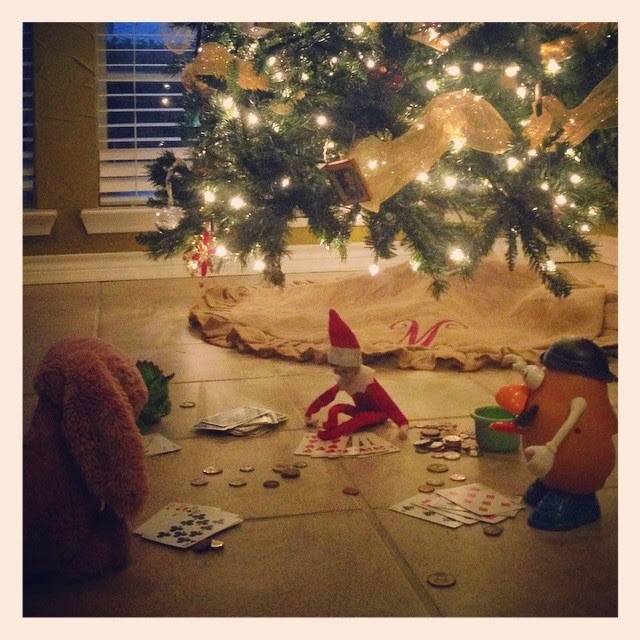 LOVE the elf on the shelf ideas! It won't be until next year when we can start it, but I can't wait! I have been looking for some new books for my daughter, it would be nice to win this! Thanks for the opportunity! Andrea I love your post. You are so creative with Buddy the elf. And Griffin with her hair tied in a "top pony tail" in adorable, happy weekend! That video...too funny! Those girls are hilarious and now I've wasted tons of my morning watching videos!! I just watched that Blank Space video yesterday and laughed so hard....so true!!! My 4-year old would LOVE that search and find pirate book! I would pick the Nativity flap book!! Oh I love the Sticker books that Usbourn has! I would totally love that wind up pirate ship book for my son! He would go crazy! Also, so impressed with all your elf adventures! How, oh how, did you ever wrap their door without them noticing? You're so sneaky! Oh gosh and I totally forgot to comment... I saw that Taylor Swift parody yesterday and LAUGHED so hard! SO TRUE. Both of my children loved the "That's not my...." books! I kept special ones in our diaper bag for emergencies! Yummy little cookbook looks like fun!! Those books look awesome! My 6 year old daughter LOVES books. The red noses are hilarious! I hope I win the books for my sweet girl! Fun giveaway! Would love to win books for my sweet kids! I love the rhyming books like Cow takes a Bow! I would love to have all the books, but my boys would love the Big Book of Dinosaurs! My boys would absolutely love any of the pirate or dinosaur books!! all of those books look awesome, such a fun giveaway! Would love a pirate book! Love your Elf ideas! Great giveaway! My son loves That's Not My Train… That is the first thing he grabs every visit to the library! My daughter would like the "That's Not My Princess" book. My son would probably like some of the science books. My little bookworm would love all those books! I'd love to get my daughter some more Christmas books, especially Advent ones! We love usborne books! Getting any of them to add to our library would be great! LOVE all of the books! I love their girly books and think my daughter would have so much fun with them!! 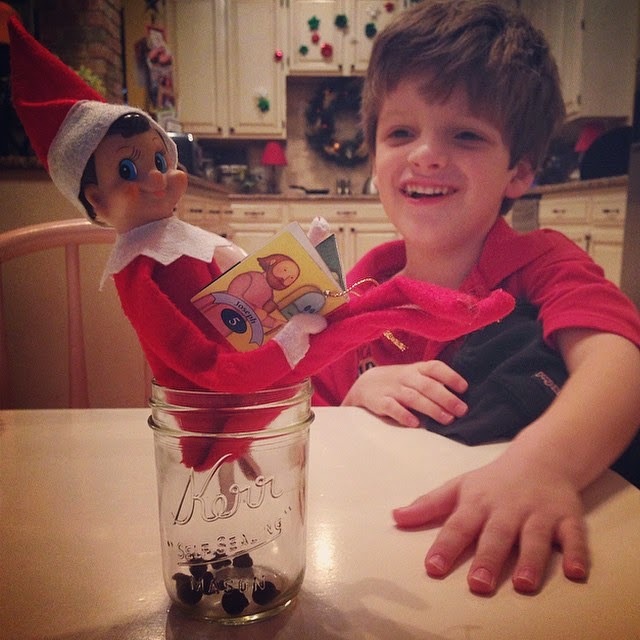 Your Elf on the Shelf ideas are darling!! I agree that people over think it and it's really just something fun to do the month of December for the kids. 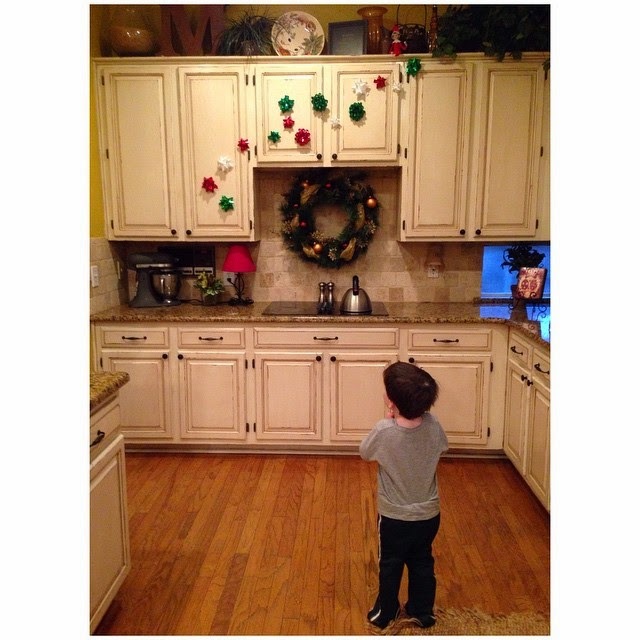 The bows on the cabinets is a great idea! My 5 year old would love the search and find books. THank you for being such a positive inspiration to me. And the pirate books would be a huge hit with my three boys! I LOVE your blog!!! These books are so cute. Thank you for this opportunity. I so love your blog! You always have great ideas and my boys love all books! Love the neat ideas for the elf. I can't wait to copy these. And the books...we love books! My boys read all of the time. Christmas books are my weakness! We would have to get the nativity flap book and the stories of Santa! 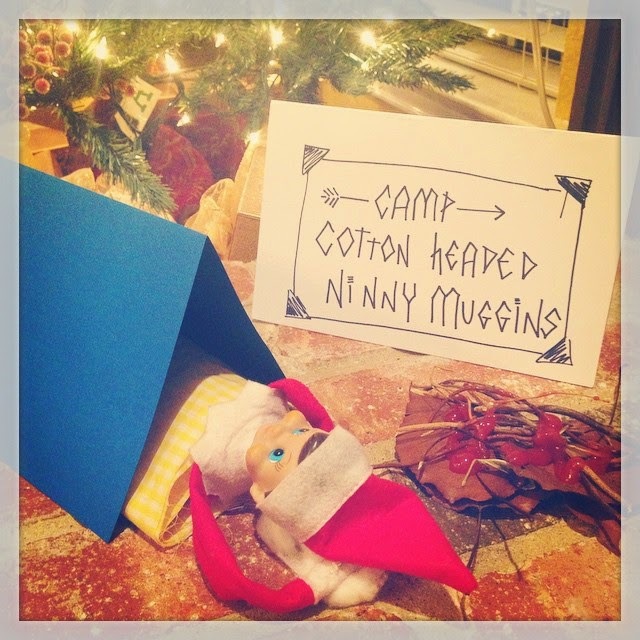 Love your adventurous elf! All of the books look great! I would definitely get some of the "That's not my..." Books for my youngest! So many to choose from - maybe the elephant & dolly ones. For my oldest - 1000 animals! I would love to get my daughter The First Thousand Words in French book. She has become obsessed with all things French lately. Thanks for your blog! Thanks for the giveaway. I would pick a princess or I-spy book! Love the Hide & Seek book of Animals! Perfect for my niece! My nephew loves all things about outer space, and Usborne seems to have quite a few that he would love! I like the board books for the littles. We love all the "that's not my...." books. Love the elf ideas and all the books! Those books are darling! Thanks for sharing!! Those books are darling! Thanks for sharing! They had a booth at the last craft fair I attended and thought they were so cute! I would love to add to Ellie's library! I'd love a "that's not my elephant" book! Love your blog! We would love to win! Those books look great! 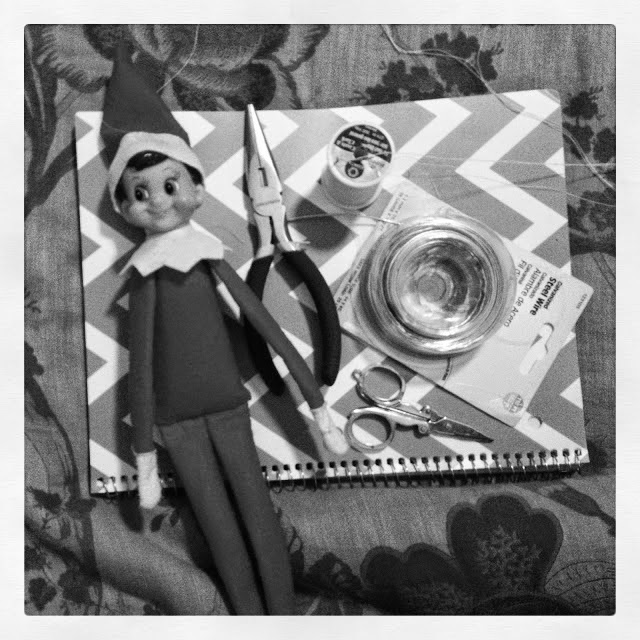 And love the bendy elf tutorial and your ideas! What a great giveaway!!! My girls LOVE the "It's Not My..." books!!!!! My boys would live the pirate book with the ship! Love reading your blog! My boys have been loving Usborne books for years! The "that's not my monster/puppy/train..." books are great! I would love to be able to get books for my granddaughter who loves books! My oldest would love all the 1001 things to find books! I love getting all my nieces and nephews books to read. Wonderful! Love the doodle boos, my 2 oldest are obsessed with coloring and drawing. I would like one of the touch and feels for my youngest! Love the books! Your elf ideas are so fun! These would makes the best gifts! I LOVE Usborne Books. The director of my school is British so we have a LOT of their books in our library. (Usborne is UK based I believe?) My students love playing their card game "Snap". My favorite book is "What the Ladybird Heard" by Julia Donaldson. I LOVE Usborne!! How can I choose just a few? 1001 Pirate Things to spot, 1001 Things at Sea to Spot, A Garden for Pig, and last but not least, Dinosaur Lift Flap Book! 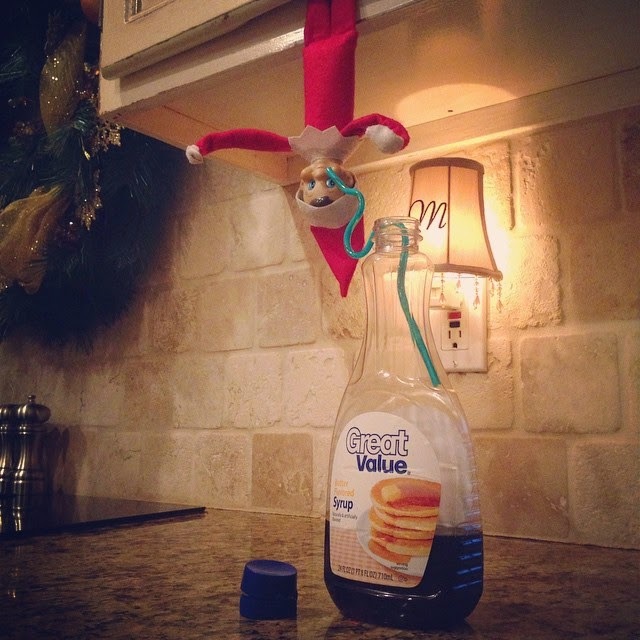 Your Elf on the Shelf ideas are awesome!! I might need to steal some ideas for next year. And I would pick some toddler specific books for my daughter, she loves everything from animals, dinosaurs and construction books. Not so much into girly, princess books right now. My son would love the Dinosaurs collection. My son would LOVE the first reading set and the Dino books! We have 6 or 8 of their books and love them all. I carried That's Not My Tractor in my purse/diaper bag for about a year with my oldest! There's nothing that my 2 yr old daughter loves more than reading! She would loooooove this! So awesome of you! Thank you! Oh I love your blog!! My kiddos love Usborne books! !